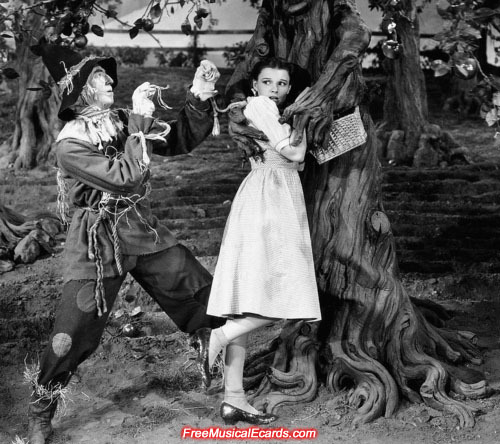 Judy Garland maintained a successful career both behind the microphone and on the big screen. After starring alongside the likes of Mickey Rooney, Lana Turner and many up-and-coming young stars in the mid 1930's, Judy Garland made serious waves when she performed as Dorothy in the hit film The Wizard of Oz (1939). Enormously talented, pretty and larger than life, Miss Garland was so popular with the moviegoing public that she had become a significant money earner for Metro-Goldwyn-Mayer Studios. She dedicated her life to entertaining people, and would often comment about how she respected her fans so much for spending their hard-earned money to watch her sing in her concert years. 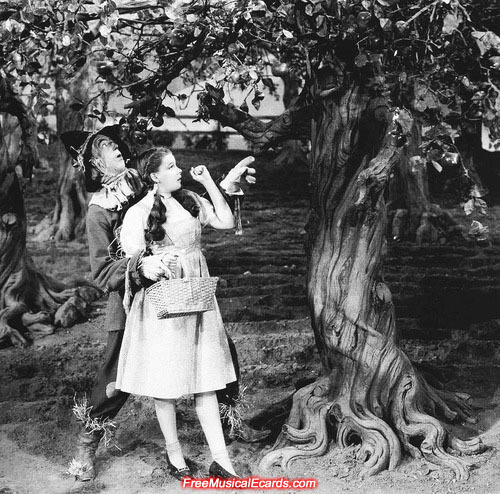 Publicity still of Dorothy (Judy Garland) and the Scarecrow (Ray Bolger) encounter the talking trees in The Wizard of Oz (1939 film). I bet you have this 'Dorothy' outfit ::). Not the checked gingham dress, but I think it's very beautiful and eye-catching. Judy Garland looked good in it.